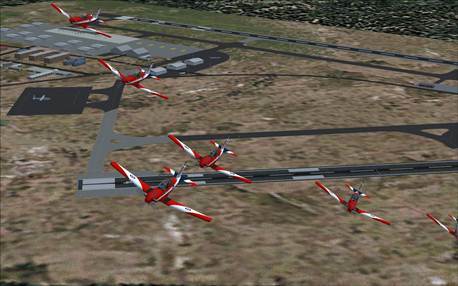 This package, from Military AI Works, features all of the PC-9A of the Central Flying School and the Roulettes aerobatic team. Based at The Royal Australian Air Force's Base East Sale, in Victoria's Gippsland region, is the location of several specialist training schools. It is probably best known as home to the Roulettes aerobatic display team from Central Flying School. Central Flying School (CFS) is a Royal Australian Air Force training unit. It operates the Pilatus PC-9 turboprop trainer. The school is responsible for training flight instructors, setting flying standards, and auditing flying practices. Included in this package are 15 KRMG Pilatus PC-9A Turbo prop trainers. The Roulettes are the Royal Australian Air Force's formation aerobatic display team. They provide about 150 flying displays a year, in Australia and in friendly countries around the South-east Asian region. The Roulettes form part of the RAAF Central Flying School (CFS). These brand new AI models here at MAIW RAAF East Sale, are produced by the very talented AI modeller’s Kevin Reed and Mark Griggs, with realistic FDE produced by Mick MacIntyre. Also included in this package is the complete custom scenery of RAAF East Sale, produced in outstanding realism and quality by Mark Griggs. All the usual voicepacks, AFD’s and effects are supplied to MAIW standard. Mon-Thu: Local time 09:05 Roulettes 1-6 depart RAAF East Sale, to their training area designated as YME1 (there is no AFD required) around a 45 minute flight to YME1. At the same local time 09:05 a 6 ship wielded model will spawn at YME1 and fly the 45 minute flight to RAAF East Sale to do 40 minutes of IFR TNG’s. There are two versions of this wielded model in two types of formation which I have rotated daily. After the TNG are completed the wielded model will return to YME1, at this time all 6 individual Roulettes will spawn at YME1 and fly back to RAAF East Sale for recovery. There is a downside to this which is no fixable due to the FS9 AI Engine, if you join the game at the time the 6 ship wielded model is performing its flypasts, it will appear on the ground at RAAF East Sale. As the wielded model has no gear it will look a little weird and out of place, so please accept this as is. I recommend not joining game between 09:45 and 10:30 local time to limit the chance of seeing the wielded model on the ground. Included in this package is the excellent freeware scenery for RAAF East Sale. This scenery will be automatically placed into the correct directory for installation when you install this package. 1) The folder “MAIW RAAF Bases” has already been installed into the “Addon Scenery” folder of your FS directory. In order to activate this scenery you must start FS9, go to Settings and find the Scenery Library. 2) Click on “ADD AREA” and navigate to the “MAIW RAAF Bases” folders which should be, by default after installation, located in “Flight Simulator 9\Addon Scenery”. Fix action: In FS9, set the AI traffic density slider to at least 10%. All AFDs were created using Flight 1’s Airport Facilitator X. Note please only open AFX formatted AFD with Flight 1 Airport Facilitator X, opening the AFX formatted AFD with any other AFD program will lose important and needed data.